I only recently learned about Vaisakhi, the harvest festival celebrated in the Punjab region of Indian, occurring on April 13th. It marks the start of the new year and new beginnings. In Canada, the Sikh community holds its annual Vaisakhi celebrations in April with a parade in Surrey, BC. Large numbers attend and according to Wikipedia, 200,000 people were at the parade in 2014. What better way to celebrate a new fresh beginning than using fresh ingredients in a delicious Indian recipe. Through my partnership with Patak’s Canada, I was challenged this month to create a festive dish using fresh Indian herbs. 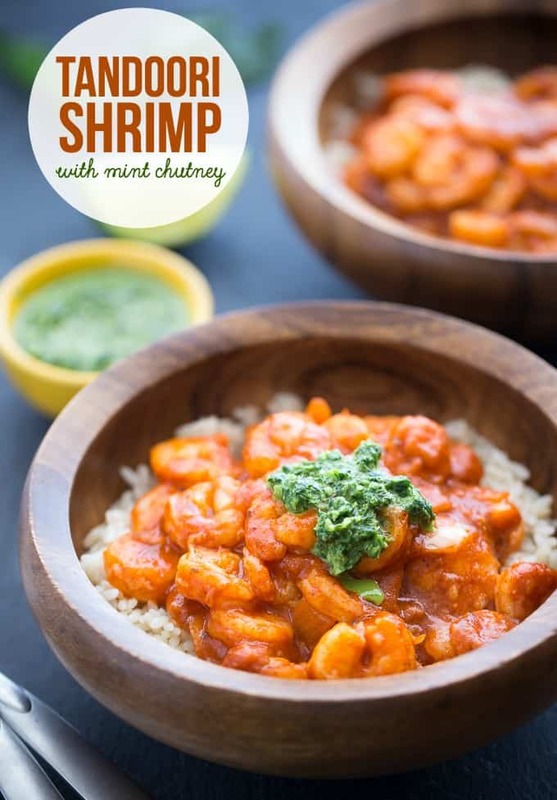 I selected mint as my herb and settled on making Tandoori Shrimp with Mint Chutney. I think that’s an appropriate recipe for a fresh start and a yummy way to “mix in a little India” at a our family’s dinner table. I selected Patak’s Tandoori Sauce for Two along with shrimp, onions and garlic. I made a mint chutney with fresh mint (obviously), cilantro, lime juice, garlic, green chilies and olive oil. The meal came together in about 20 minutes and that includes me cooking the rice to serve it with. Normally, you think of chicken served with Tandoori, but I thought it would be fun to try a different protein. 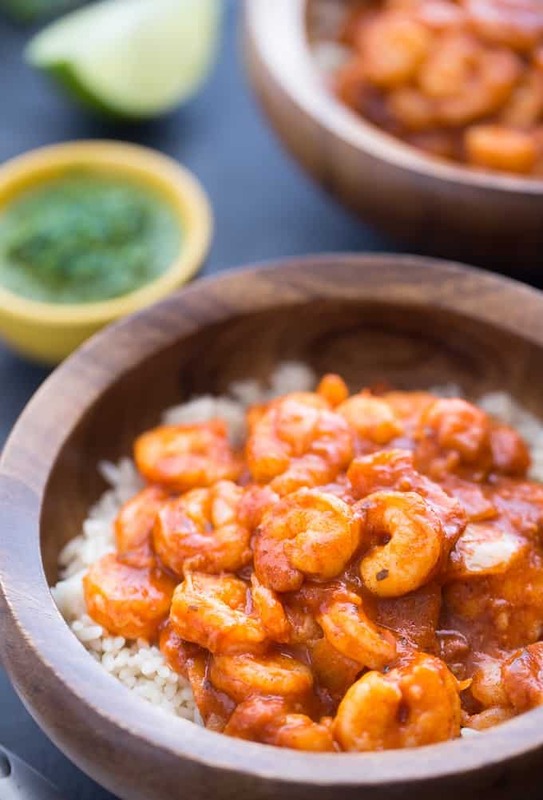 We are big seafood fans, especially shrimp. I choose well because the dish turned out fabulous. Tandoori sauce is fairly mild with its blend of tamarind, coriander and cumin. It won’t overwhelm your tastebuds with heat as some other types of Indian sauces can. 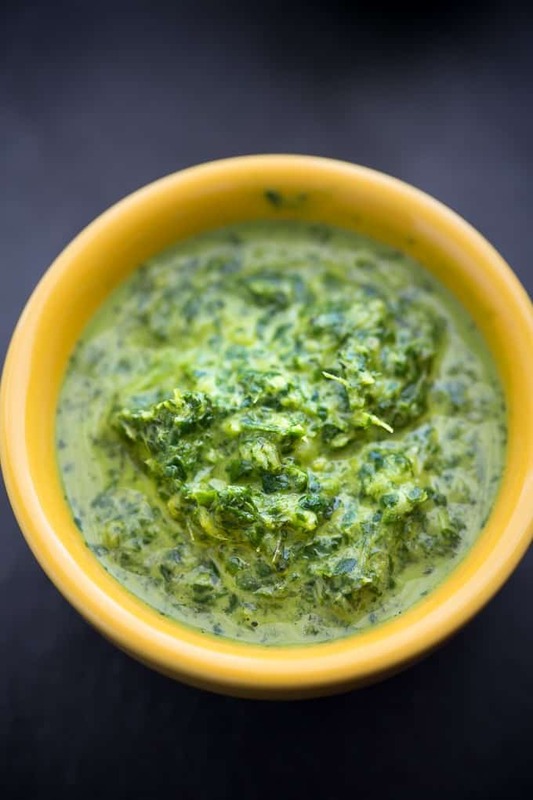 I pureed the herbs, garlic, lime and olive oil to create this flavourful mint chutney. It gives a nice contrast of flavours paired with the Tandoori Shrimp. I added about a tablespoonful to each bowl and then mixed it in to enjoy. I loved the extra burst of freshness! Next time I make this recipe, I’m going to double it. We ate it one evening when the kids were over at Grandma and Poppa’s house. I think my girls would like it. I’m not sure if they’d eat the mint chutney so I’d keep that on the side just in case. Patak’s Canada has another recipe you could try with the Tandoori Sauce for Two: Tandoori Roasted Root Vegetable Stew. Check out my previous recipes made with Patak’s Canada products: Curried Lentil Rice, Butter Chicken Hand Pies, Indian Meatloaf , Bacon Wrapped Chicken Bites with Mango Chutney and Butter Chicken Lasagna Soup. 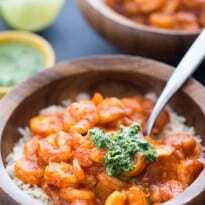 Mix in a little India with this flavourful Indian recipe. It’s easy to make and not too spicy. Divide rice evenly between two serving bowls. Top with Tandoori Shrimp mixture. Add about a tablespoon of mint chutney on top, if desired. How do you mix in a little India to your meals? I tried something close to your recipe. It turned out great. I have to try with shrimps. We are not shrimp fans in this house but I am thinking I could do it with chicken too. Thanks for sharing. I have a few of their products and was wondering what to make this sounds really good! 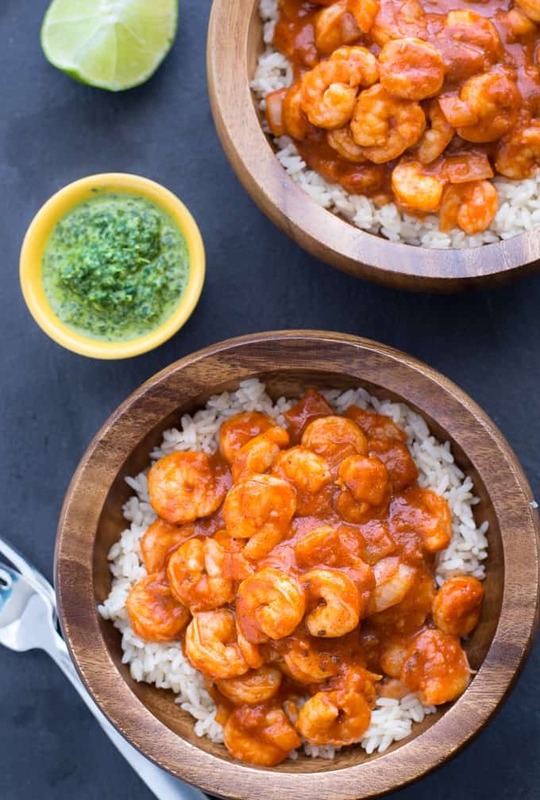 We love fresh shrimp and eat it at least once a month. This looks delicious! This looks so good! I cannot wait to try it. I’m a huge fan of Tandoori chicken and this sounds so awesome!! 🙂 Definitely gonna give it a try! 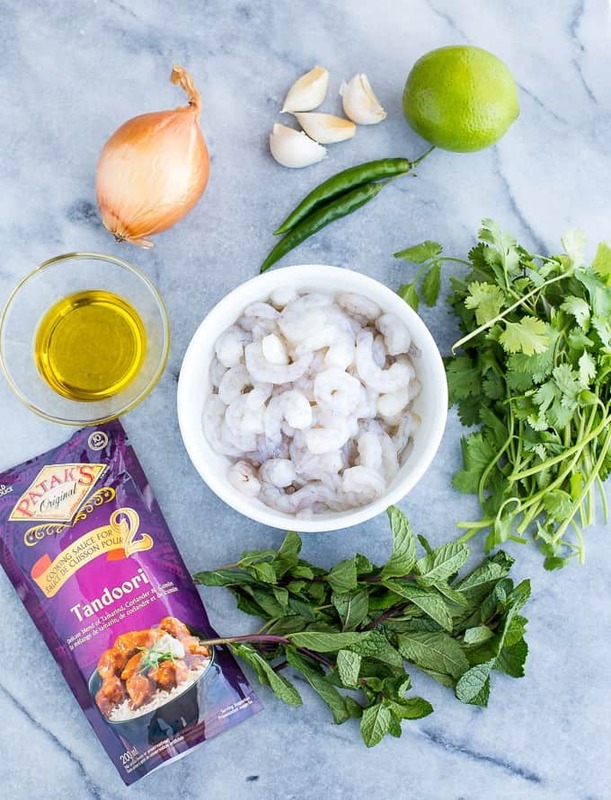 We love tandoori chicken around here, and shrimp’s such a quick and easy food to make, I’m thinking this tandoori shrimp would taste just wonderful! Using a premade sauce helps too. 🙂 Sounds and looks wonderful! What a great way to take a little trip to India without leaving home – and any ole night of the week! 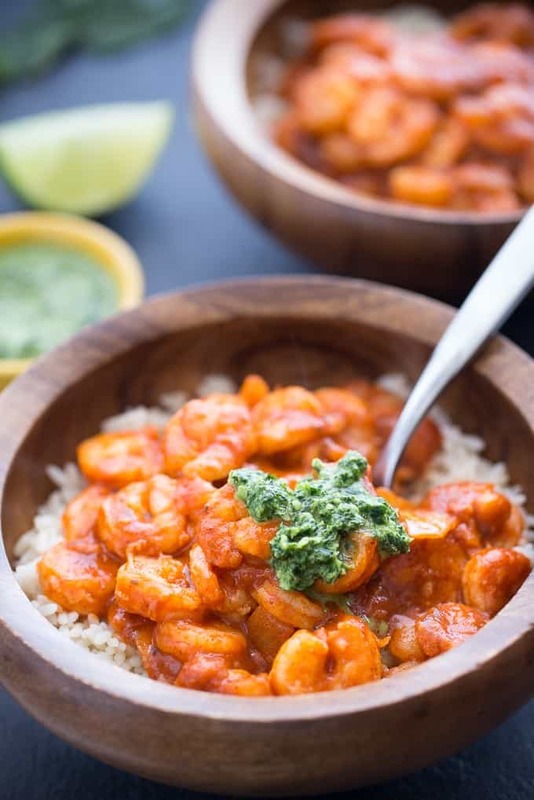 Love this shrimp and that bright, fresh mint chutney sounds so delicious! 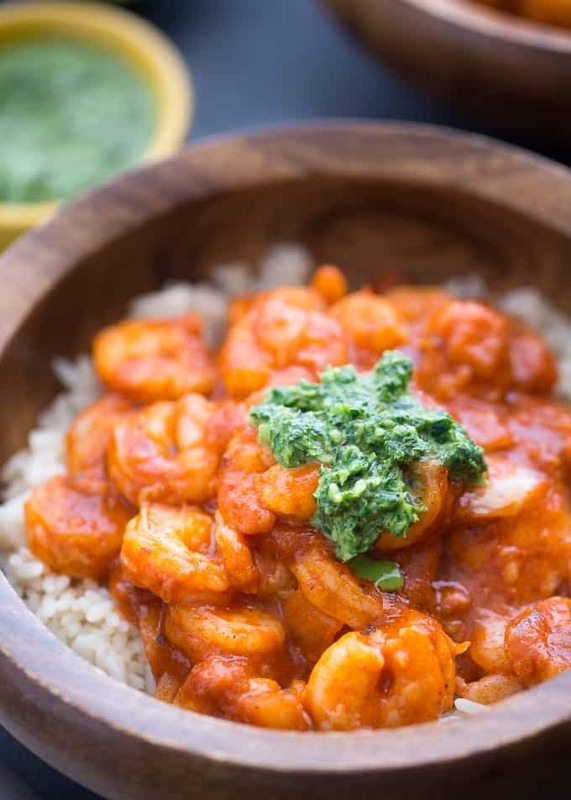 I’ve never had curry before, but shrimp and rice are a great way to get me to try it.